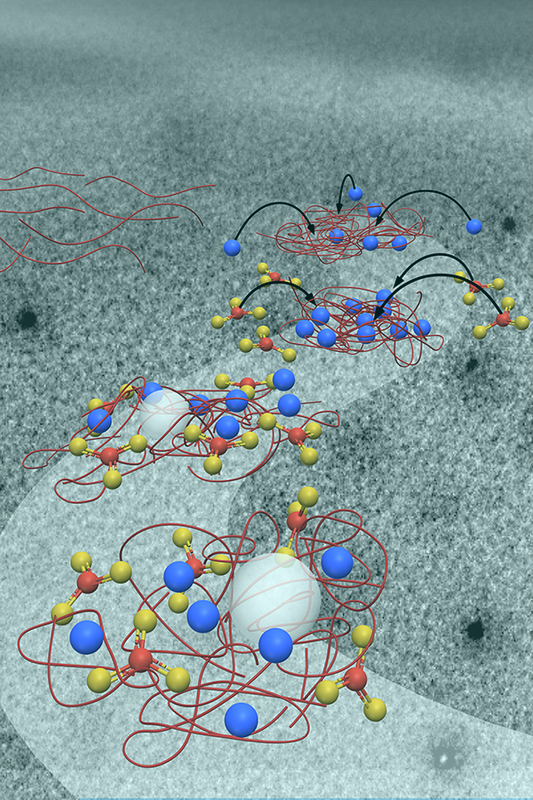 Changing conventional wisdom, researchers found calcium binding (blue) to the polymer (red strands) leads to the formation of macromolecular scaffold that controls location and phase of calcium carbonate nuclei (white particles). Enlarge image. Results: Nature packs away carbon in chalk, shells, and rocks made by marine organisms that crystallize calcium carbonate. Now, research suggests that the soft organic scaffolds in which such crystals form direct crystallization by soaking up the calcium like an "ion sponge," according to new work in Nature Materials. Using a powerful microscope that lets researchers see the formation of crystals in real time, a team led by the Pacific Northwest National Laboratory found that negatively charged molecules -- such as carbohydrates found in the shells of mollusks -- control where, when, and how calcium carbonate forms. These large macromolecules do so by directing where calcium ions bind in the scaffold rather than by providing the best environment for the crystal, as thought previously. "This whole story is different from what we had believed to be the case," said lead researcher Dr. Jim De Yoreo at PNNL. "Ion binding defines a completely different mechanism for controlling crystallization than does making a perfect interface between the crystal and the scaffold. And it is one that should provide us with considerable control." Why It Matters: Understanding the process better may help researchers to design bioinspired approaches to synthesize materials with unique structural, optical, and responsive properties. Further, it may help researchers interpret the ancient climate record and figure out how to remove climate-changing carbon dioxide from the atmosphere and ocean. Methods: Previous work showed that calcium carbonate takes multiple routes to becoming a mineral. All of the common crystal forms, including calcite (found in limestone), aragonite (found in mother-of-pearl), and vaterite (found in gallstones), crystallized from solution, often at the same time. But in some cases, droplet-like particles of uncrystallized material known as amorphous calcium carbonate, or ACC, formed first and then transformed into either aragonite or vaterite. Those experiments, however, lacked a crucial element found in the biological world, where minerals form within an organic scaffold. For examples, pearls develop in the presence of negatively charged carbohydrates and proteins from the oyster. In addition, these biominerals often start out as ACC. De Yoreo and his colleagues wondered what role these macromolecules play. But this time they added a negatively charged macromolecule, a polymer called polystyrene sulfonate. Without the polymer, they saw crystals of vaterite and a little calcite forming randomly under the microscope. With the polymer, however, ACC always appeared first and vaterite formed much later. Because the polymer interfered with vaterite formation, the team looked a little closer at what the polymer was doing. When they mixed just the polymer with the calcium before introducing carbonate, they found globules of the polymer forming in the solution. They determined that the polymer had soaked up more than half of the calcium to form the globules. When the researchers then added carbonate to the experimental chamber, ACC formed instead and it only appeared within these globules. The ACC grew in size until the supply of calcium ran out. The researchers concluded that calcium binding to the polymer is the key to forming the ACC and controlling where it forms. The team realized that controlling crystallization by attracting calcium ions to the macromolecules was not the way researchers had long thought it happened. There are two main ways that calcium carbonate molecules might be persuaded to come together to form a mineral. One is by providing an environment where the crystal is most thermodynamically favored -- the atoms assemble in the crystal in the least energetic way possible, sort of like organizing a classroom full of schoolchildren by having them sit in seats arranged neatly in rows side-by-side in the corner of the room. Another is via chemical binding -- negatively or positively charged atoms or molecules called ions attract one another, sort of like waving popsicles in front of those kids to gather them in one spot. Researchers had long suspected that organic scaffolds caused calcium carbonate to mineralize and find its most stable form, calcite, by creating low energy surfaces where the ions could easily arrange themselves in rows side-by-side. In fact, scientists had seen this previously with highly organized films of organic molecules. But in this study, the polymer pulls in the calcium before minerals can form and turns it into ACC. This showed the researchers that ion binding can completely overwhelm any lower-energy advantage that crystallization on or outside of the polymer might confer. "This is definitely another means of controlling nucleation," said De Yoreo. "Carbonate ions follow the calcium into the globules. They don't crystallize outside the globules because there's not enough calcium there to make a mineral. It's like bank robbers out for a heist. They go where the money is." What's Next? "This work opens new avenues for the investigation of biomineralization. Can we extend these experiments beyond the simple polymers we used here? To what extent can we rebuild parts of the biological machinery inside the microscope?" said co-author Prof. Nico Sommerdijk of Eindhoven University of Technology. "Answering these questions may eventually allow us to understand the biological mineral formation and apply its principles to design green, sustainable routes for the production of advanced materials." Sponsors: This research was supported by the U.S. Department of Energy Office of Science's Office of Basic Energy Sciences at Lawrence Berkeley National Laboratory, and at the Pacific Northwest National Laboratory. Characterization of PSS globule formation was supported by the Materials Science and Engineering Division. Investigation of calcium carbonate nucleation was supported by the Division of Chemical Sciences, Geosciences, and Biosciences. The work of P.J.M.S. and N.A.J.M.S. is supported by a VICI grant of the Dutch Science Foundation, NWO, The Netherlands. Reference: Smeets PJM, KR Cho, RGE Kempen, NAJM Sommerdijk, and JJ De Yoreo. 2015. "Calcium Carbonate Nucleation Driven by Ion Binding in a Biomimetic Matrix Revealed by In Situ Electron Microscopy." Nature Materials 14:394-399. DOI: 10.1038/NMAT4193.